A couple of oversights don’t stop Plogue’s exacting tribute to the OPLL winning our hearts with its vivid FM sounds. Easy to create custom sounds. Great step sequencing and effects. Only one layer can be edited. The first in Plogue’s new chipsynth line of retro digital synth emulations, PortaFM (VST/ AU/AAX/Standalone) is a fastidiously modelled virtual take on the chip at the heart of Yamaha’s PSS series of low-priced FM-based instruments from the 80s, including the PSS-140, -170 and -270 keyboards, and SHS-10 and -200 keytars. PortaFM actually layers and/or splits two emulated OPLL chips, for thicker sounds than were possible with the real thing, or dual-voice patches. Each of the two layers has its own tuning, panning and glide parameters, as well as up to 100ms of note-on delay and three DAC settings: the original analogue output, a ‘perfect’ 9-bit DAC and a 12-bit DAC. The tone generated by each layer is selected from a series of preset sound menus, drawing on models of the OPLL-X and OPLL-P variants as well as the original OPLL. However, selecting the ‘custom sound’ option for a layer hands it over to the Patch page editor, where the Carrier and Modulator oscillators are programmed in detail (see Carry that weight). There’s only one custom sound, so you can only edit one layer. Plogue tell us that this is by design, in the interest of keeping the synth true to the OPLL’s character and vibe, but we’d still like to be able to mess around with both layers independently. Why not, after all? On top of the two main OPLLs, a third emulation brings the five drum sounds of the original chip into play, for use individually or splitting/layering into your main patch. Comprising kick, snare, hats, tom and cymbal, they’re uneditable beyond volume, pan, delay, pitching and velocity sensitivity, but retro noiseniks will love them just as they are. As amusing and usable as PortaFM’s preset operator setups are, designing your own custom sounds in the Patch page is where the real fun starts. Vertical sliders set the Modulator and Carrier oscillators, and their amplitude envelopes. Each oscillator can have its base frequency multiplied by between 0.5 and 15x, and be set to halve in volume every one, two or four octaves above G2, for reining in excessive high frequencies via modulation or levelling. The Modulator is volume-adjustable and can modulate itself to the point of very noisy self-oscillation. The buttons below activate various extra functions. Wave switches the waveform from a sine to a more harsh half-sine, while EnvPerc bypasses the envelope Sustain stage for percussive sounds, and KS Rate doubles the envelope speed with every octave increase. Vibrato and Tremolo activate fixed- rate/depth frequency and volume-assigned LFOs, as found in the original OPLL. Modulation routings are made in a straightforward mod matrix, featuring Min/Max and Offset settings, and a secondary ‘via’ Control option (MIDI CC only). Mod sources consist of all MIDI CCs and streams (monophonic or polyphonic), a randomiser (mono or poly) and 16 powerful Step Sequencers, each one containing up to 127 sequences of up to 64 steps that can, themselves, be swept through and modulated. Modulation targets cover most parameters, including drum triggers but not effects parameters. On that subject, PortaFM’s effects - Arpeggiator, Chorus, Ambience Reverb and Stereo Delay - are as impressive as the Step Sequencers, with plenty of controls and first-rate sound quality, particularly the reverb. 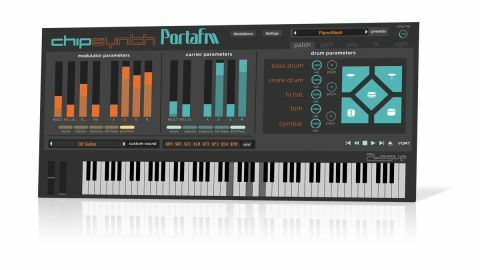 Quirky, crusty and idiosyncratic in its core architecture and design, yet modern and capable in its modulation and processing, and surprisingly weighty when it wants to be, PortaFM is a wonderfully endearing synth at exactly the right price. Its relevance to your music will, obviously, be quite dependent on your level of nostalgia for ‘cheap’ old-school FM sounds, but don’t let that put you off - PortaFM would make a fine addition to any electronic musician’s sonic arsenal.